Please note: This document is subject to updates by Bruce Camber and many others. Propaedeutics: Analyze three very simple concepts taken from a high school geometry class, (1) the smallest-and-largest measurement of a length, (2) dividing and multiplying by 2, and (3) nested-embedded-and-meshed geometries. Though initially a simple thought exercise (hardly an experiment), our students quickly developed a larger vision to create a working framework to categorize and relate everything in the known universe. Though appearing quite naive and overly ambitious in its scope, the work began at the Planck Length and proceeded to the Observable Universe in somewhere over 201 base-2 exponential notations. That range of notations is examined and the unique place of the first sixty notations is reviewed. This simple mathematical progression and the related geometries, apparently heretofore not examined by the larger academic community, are the praxis; interpreting the meaning of it all is the theoria, and here we posit a very simple foundation to open those discussions. Along this path it seems we will learn how numbers are the function and geometries are the form, how each is the other’s Janus face, and perhaps even how time is derivative of number and space derivative of geometry. Four pivotal hexagonal plates are outlined (red-white-blue-yellow); all surround the center point. Our class was basic science and mathematics, focusing on geometry. My assignment was to introduce the students to the five platonic solids. Yet, by our third time together, we were engaging the Planck Length. Is it a single point? Is it a vertex making the simplest space? What else could it be? Can it be more than just a physical measurement? Are we looking at point-free geometry? 10 Is this a pre-structure for group theory?11 Speculations quickly got out of hand. The third doubling renders eight vertices. With just seven of those vertices, a pentagonal cluster of five tetrahedrons can be inscribed (Illustration 3), however, there is a gap of about 7.36° (7° 21′) or less than 1.5° between each face.19 There are many other configurations of a five-tetrahedral construction that can be created with those seven vertices. These will be addressed in a separate article. For our discussions here, it seems that each suggests a necessarily imperfect construction. The parts only fit together by stretching them out of their simple perfection. One might speculate that the spaces created within these imperfections could also provide room for movement or fluctuation. With all eight vertices, a rather simple-but-complex figure can be readily constructed with six tetrahedrons, three on either side of a rather-stretched pyramid filling an empty space between each group. This figure has many different manifestations using just eight vertices. Between seven and eight vertices is a key step in this simple evolution. Both figures can morph and change in many different ways, breaking-and-making perfect and imperfect constructions. In one’s most speculative, intuitive moments, one “might-could” see these constructions as a way of engaging the current work with the Lie Group,20 yet here may begin a different approach to continuous transformations groups. Just by replicating these eight vertices, a tetrahedral-octahedral-tetrahedral (TOT) chain emerges.21 Here octahedrons and two tetrahedrons are perfectly aligned and a simple structure reaching from the smallest to the largest readily emerges and tiles the universe. Then, there is yet another very special hexagonal tiling application to be studied within the octahedron by observing how each of the four hexagonal plates interact with all congruent tetrahedrons. 1 Our Start Date: Monday, December 19, 2011 Bruce Camber substituted for the geometry teacher within the John Curtis Christian High School, just up river from New Orleans. The concept of a Big Board – little universe developed within the context of these classes. 3 Base-2 Exponential notation: For most students, the wheat & chessboard example is their introduction to exponential notation. Wikipedia provides an overview. 11Group Theory and Speculations: One might speculate that group theory, with its related subjects such as combinatorics, fields, representation theory, system theory and Lie transformation groups, all apply in some way to the transformation from one notation to the next. Yet, two transformations seem to beg for special attention. One is from the Human Scale to the Small Scale and the other from the Human Scale to the Large Scale. If there are 202.34-to-205.11 notations, our focus might turn to steps 67 to 69 at the small scale and 134 to 138 at the large scale universe. One’s speculations might could run ahead of one’s imaginative sensibilities. For example, at the transformation to the small scale, approximately in the range of the diameter of a proton, one could hypostatize that this is where the number of embedded geometries begins to contract to begin to approach the most-simple structure of the Planck Length. It would follow that within the small-scale all structures would necessarily be shared. Perhaps the proton is some kind of a boundary for individuation. That is, the closer one gets to the singularity of the Planck Length, the more those basic geometric structures within the notation are shared. Because this structure currently appears to be beyond the scope of measuring devices, we could refer to these notations as a hypostatic science, whereby hypotheses, though apparently impossible to test, are still not beyond the scope of imagination. Also, as the large scale is approached, somewhere between notations 134 to 138, there might be a concrescence that opens the way to even more speculative thinking. Though not very large — between 248 miles (notation 134) and- 3500 miles (notation 138) — it might appear to be silly, truly nonsensical, to begin the search for the Einstein-Rosen bridges or wormholes! That’s certainly science fiction. Yet, if we let an idea simmer for awhile, maybe workable insights might-could begin to emerge. 12 Purdue & NSF: Although the term, Thrust of Life, is used within religious and philosophical studies, it is also the subject of continuous scientific study by groups such as the Center for Science for of Information (Purdue University) through funding from the National Science Foundation. 13 Freeman Dyson: Personal email to me regarding multiplying the Planck Length by 2, he said: “Since space has three dimensions, the number of points goes up by a factor eight, not two, when you double the scale.” Certainly a cogent comment, however, given we have seemingly more than enough vertices, we decided on the first pass to continue to multiply by 2 to create an initial framework from which attempt to grasp what was important and functional. In 1970 Bruce Camber began his initial studies of the 1935 Einstein-Podolsky-Rosen (EPR) thought experiment. In 1972 he was recruited by the Boston University School of Theology based on (1) his research of perfected states in space-time through work within a think tank in Cambridge, Massachusetts, (2) his work within the Boston University Department of Physics, Boston Colloquium for the Philosophy of Science, and (3) his work with Arthur Loeb (Harvard) and the Philomorphs. With introductions by Victor Weisskopf (MIT) and Lew Kowarski (BU), he went to CERN on two occasions, primarily to discuss the EPR paradox with John Bell. In 1979, he coordinated a project at MIT with the World Council of Churches to explore shared first principles between the major academic disciplines represented by 77 peer-selected, leading-living scholars. In 1980 he spent a semester with Olivier Costa de Beauregard and Jean-Pierre Vigier at the Institut Henri Poincaré focusing on the EPR tests of Alain Aspect at the Orsay-based Institut d’Optique. In 1994, following the death of another mentor, David Bohm, Camber re-engaged simple interior geometries based on several discussions with Bohm and his book, Fragmentation & Wholeness. 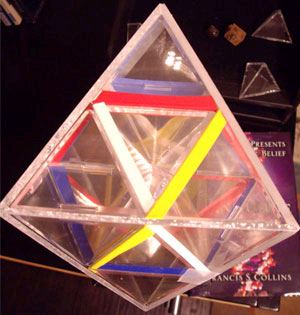 In 1997 he made the molds to manufacture clear plastic models of the tetrahedron and octahedron. These models are used just above. In 2002, he spent a day with John Conway at Princeton to discuss the simplicity of the interior parts of the tetrahedron and octahedron. In 2011, he challenged a high school geometry class to use base-2 exponential notation to follow the interior structure of basic geometries from the Planck Length and to the edges of the Observable Universe. The first iteration of the Big Board-little universe was created. In September 2013, the first iteration of the Universe Table was created. In 2014, a chart to enclose a moment of perfection extending from the chaotic to the good was introduced. This entry was posted in Basic geometry, Education, Edward Frenkel, Elon Musk, Frank Wilczek, Freeman Dyson and tagged base-2 exponential notation, nested geometries, planck length. Bookmark the permalink.